“White-Collar Crimes” from Christian Faith Publishing author George Foster is one layperson’s journey to restore Holiness to his Church by exposing child molestation and priestly infidelity. 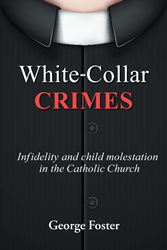 “White-Collar Crimes”: a gripping and potent look at the depravity that is discovered within the Catholic Churches. “White-Collar Crimes” is the creation of published author, George Foster, a devoted Catholic who hopes that his story awakens the souls of the faithful, a justifiable anger, and a burning love to defend the Church. Published by Christian Faith Publishing, George Foster’s new book explores the reasons for the corruption with in the Church and answers why it stays hidden. Foster explains how the decades of deceit, abuse, and molestation of hundreds of children was brought to light with the hope that each reader can not only understand the level of treachery, but may be able to help stop a culture of immorality. View a synopsis of “White-Collar Crimes” on YouTube. Consumers can purchase “White-Collar Crimes” at traditional brick & mortar bookstores, or online at Amazon.com, Apple iTunes store, or Barnes and Noble. For additional information or inquiries about “White-Collar Crimes”, contact the Christian Faith Publishing media department at 866-554-0919.